Non-tacky geek room decor products are few and far between but look for them long enough, and you’re guaranteed to find at least a handful of hidden gems. Well, we’ve done the looking for you and selected top 5 of the month. Enjoy! Sold exclusively by ThinkGeek, this decorative toy creates a mesmerizing optical illusion that tricks you into believing that you’re looking into an endless corridor illuminated by flicking candles. No matter which direction you look from, the optical illusion keeps your brain confused and satisfied with the purchase of this geeky desk or wall accessory. The ThinkGeek Infinite Dungeon requires three AA batteries to work and features three brightness settings, allowing you to adjust its brightness to add the right atmosphere to your D&D sessions. At less than $30, the ThinkGeek Infinite Dungeon also makes a great gift that is guaranteed to please nerds both young and old. This decorative laser-engraved crystal ball blends modern technology with traditional craftsmanship. The first functioning laser saw the light in 1960 at Columbia University. Since then, lasers have gone through many improvements and iterations and found numerous applications across many industries. Today, laser engraving machines are available for just a few hundred dollars, and the results they deliver are surprisingly great. But don’t expect to create anything like this laser-engraved crystal ball with a regular home laser engraver. Ornerx used a commercial-grade laser to etch a lifelike image of a galaxy inside K9, which is Chinese Optical Borosilicate Crown Glass. K9 is typically used for lenses and prisms for lasers and optics. The crystal ball is supported by a wooden stand, and both the ball and the stand are sold together for $25. Have you played Super Mario so much that you dream about the Mushroom Kingdome and Princess Peach? If not, this Super Mario-themed mushroom lamp may be just what you need to invoke lucid dreams about the incredibly popular video game series from Nintendo. When switched on, the Super Mario Lamp makes the iconic “level-up” sound effect, and it glows a soft red color that’s basically a perfect antidote for blue light emitted by modern display screens of computers, laptops, smartphones, and other electronic devices. Unlike many other similar products on the market, this Super Mario Lamp is officially licensed by Nintendo and made from safe materials, making it suitable even for children ages 6 and older. To stay with Nintendo for a little longer, we’ve picked another product from ThinkGeek: retro 8-bit NES Mario wall decals. Included in the kit are three 26″ x 40″ sheets with strong yet easily removable adhesive on one side. Depending on your wall paint, you might even be able to reuse the wall decals without any damage to your wall or the decals themselves. To replicate the design displayed on the promotional pictures, you need about three packages, which would bring the total cost up to $150 as one package costs $50. We think that’s a fair price for such well-made wall decals, but we’re admittedly huge Nintendo geeks, so your mileage may vary. Magnetic levitation is seriously cool. Why? Because it breaks Earnshaw’s theorem, which proves that it is not possible to achieve static levitation using any combination of fixed magnets and electric charges. So how come this beautiful light bulb with a base made from solid wood remains suspended in the air as if it were held in place with magic? Because the base contains an electromagnet and a feedback system that detect the position of the light bulb in space and varies the strength of electromagnet depending on the precise position of the light bulb. 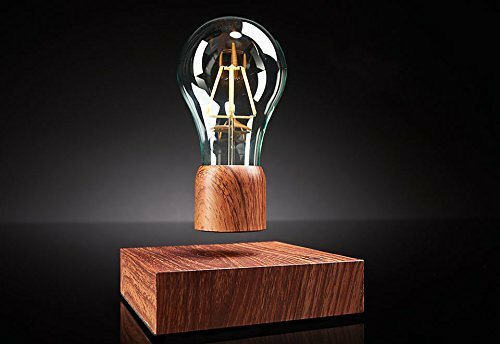 Despite its vintage design, this levitating light bulb actually contains several modern LEDs rated for over 30,000 hours of use. Because the energy-efficient LEDs and the electromagnet that keeps the light bulb suspended in the air don’t consume any significant amount of electricity, you can keep the light bulb in its levitating state without worrying about your electricity bill.